A fusible link will melt if the electrical circuits from the battery are ever overloaded, thus preventing damage to the entire wiring harness. (This could be caused by a short in the system drawing too much current.) If this ever happens, have a Hyundai dealer determine the cause, repair the system and replace the fusible link. The fusible links are located in a relay box in the engine compartement for easy inspection. When replacing a fusible link, never use anything but a new fusible link with the same or lower amperage rating. Never use a piece of wire or a higher-rated fusible link. This could result in serious damage and create a fire hazard. The fuse box for the lights and other electrical accessories will be found on the left side of crash pad. Inside the box you will find a list showing the circuits protected by each fuse. 2. Open the fuse box and examine each fuse. Remove each fuse by pulling it toward you (a small "fuse puller" tool is contained in the relay and fuse box of the engine room to simplify this operation). 3. Be sure to check all other fuses even if you find one that appears to have opened. 4. 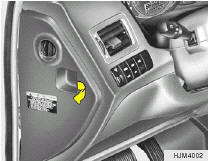 Replace the blown fuse by pressing a new fuse of the same rating into place. The fuse should be a snug fit. If it is not, have the fuse clip repaired or replaced by a Hyundai dealer. If you do not have a spare fuse, you may be able to borrow a fuse of the same or lower rating from an accessory you can temporarily get along without (the radio or cigarette lighter, for example). Always remember to replace the borrowed fuse.